Nilani Rathnayake won the Gold medal in the 3000m steeplechase with a time of 9 minutes 55.59 seconds, which was also a new Sri Lanka record, at the ‘Road to Asian Games 2018 ‘ test event continued at Jakarta yesterday. 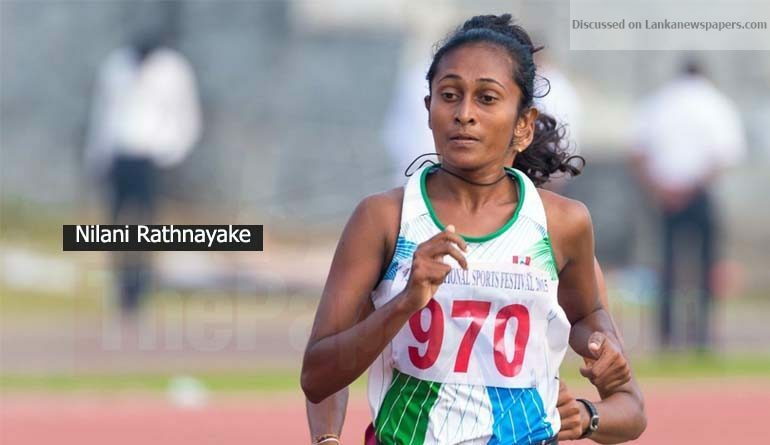 It was a remarkable feat by Rathnayake as she renewed her own SL record and became first Sri Lankan to go below the 10-minute mark in the event. Trained under Coach Sajith Jayalal, Nilani has been in prime form in the event recently. She had to face disappointment at the last Asian Championship as she gave up the race halfway. This performance could have easily sealed a Gold medal there. Meanwhile, men’s 3000m steeplechase runner R.M.S. Pushpakumara, too, sealed a Gold medal of the event with a time of 8 minutes 59.70 seconds. In other events of the day, the two middle distance runners Nimali Liyanarachchi and Gayanthika Abeyrathne could not impress as they finished second and third respectively in the 800m with times of 2 minutes 07.95 seconds and 2 minutes 08.27 seconds. Himasha Eashan decided to run in the 4X100m relay despite an injury concern, and the team clocked 39.71 seconds and finished second behind host Indonesia who clocked 39.07 seconds. Men’s 4x400m relay team however, justified the selector’s decision to omit them from the Commonwealth Games having clocked a disappointing 3 minutes 08.26 seconds and finishing third behind India and Chinese Taipei. In the Men’s triple jump Sanjaya Jayasinghe could only finish fourth with a jump of 15.49m.